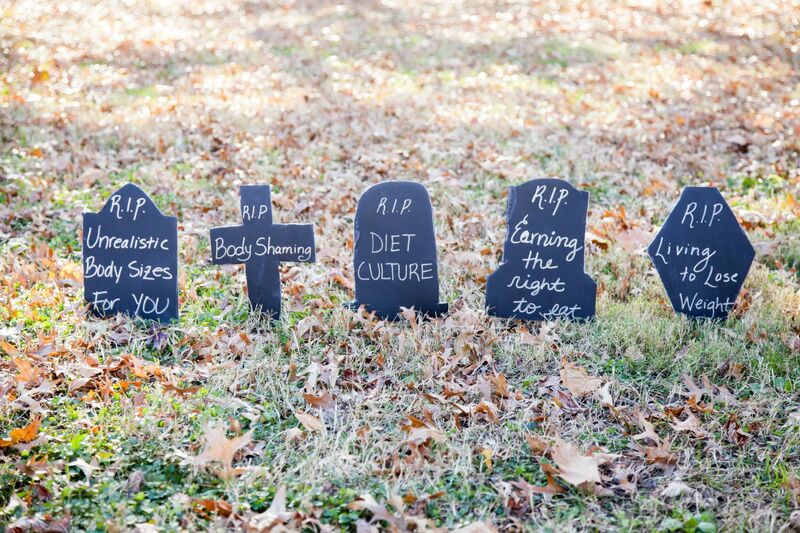 Let’s let judgments about physical bodies die. The judgments we have about whether someone appears healthy, acts healthy, or meets our standards. Other people’s health is not our business. It is never appropriate to comment on someone’s physical appearance, especially in a judgmental way. And with this death, let us release judgment of our own bodies as well. As we learn to love our own bodies we suddenly stop finding the urge to judge anyone else because we’re more comfortable in our own skin. We no longer need to fight our natural shape or try to be the size we were when we were fifteen for the rest of our lives. We do not need to compare our bodies to other people’s, or past versions of our own body. When you love your body and nourish it, it will find the shape it is supposed to be in a happy way. And that might not align with what a magazine tells you is beautiful, but that is what we are letting die here today. Today you bury the concept that you have to earn the privilege to eat. You need to food to live, and if you have food available to eat and you are hungry, then you should eat. Whether or not you exercised is irrelevant to if you need or want to eat. You don’t get to eat because you exercised and you don’t have to have a salad because you didn’t exercise. You can also have a second plate or dessert if you want to. Screw the notion that you have to lose weight if you’re not the “ideal” body type. Just because you’re fat doesn’t mean you need to be on a diet. You do not need to wake up every day with a mission to lose weight. Your existence is not to prove a certain appearance. You are so much more than how you look. It’s time we lay to rest the entire concept of diet culture. We don’t need to restrict our eating, we don’t need to be on diets, we don’t need to have a disordered relationship with food. Body shaming is cruel, and judging your own body moves you in the opposite direction of self-love and body positivity. It can end up running your life! You are already beautiful, but you have so much more to offer the world than your physical appearance so let’s focus on your gifts and not get hung up on how your body looks, babe. Check out my Body Positivity E-Course! Omg, this is so great, Mary! I love it! I used to have a tshirt that read “riots not diets”. I wish I still had it!